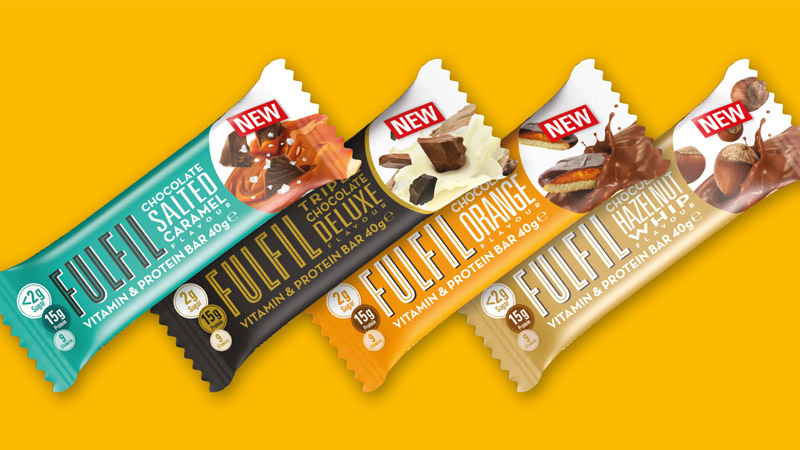 Fulfil – the UK’s fastest-selling* vitamin & protein bar – has expanded its offering with the launch of a new 40g bar that has the added benefits of 15g of protein, less than 2g of sugar and nine vitamins. The exciting new range also introduces two new flavours, Chocolate Salted Caramel and Chocolate Hazelnut Whip. The new smaller sized range has been developed following extensive category research into the rational choices consumers make between functional snacks and traditional confectionery lines. Brian O’Sullivan, chief executive at Fulfil Nutrition said: “It has been overwhelming to see the response we have had in the UK, both from retailers and consumers. With increasing demand for more flavours and options, we are committed to creating bars with benefits which have all the advantages of high protein and low sugar, but with the great taste of traditional sweet treats. With the creation of a 40g bar – which complements the original 55g offering aimed at a more traditional ‘protein consumer’, Fulfil is aiming to appeal to a wider range of consumers who are actively seeking tasty, healthier snacks, but not necessarily a larger, more filling snack with 20g of protein. The new 40g bar will be available in four flavours including the newly launched Chocolate Salted Caramel and Chocolate Hazelnut Whip, as well as Triple Chocolate Deluxe and Chocolate Orange. *IRI Marketplace Data, GB Market, 12 weeks to 12th August 2018 – Fulfil Peanut & Caramel, units per point of weighted distribution, excludes SKUs in <10% distribution.